Several browsers use tabs (the following figure shows tabs in the Microsoft Edge app), which allow you to keep multiple web pages open at once and easily switch among them by clicking the tabs. 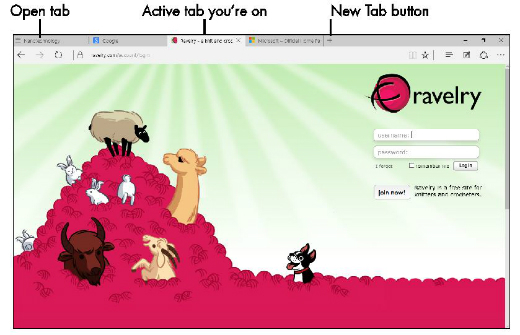 A tab is a sort of window you can use to navigate to any number of web pages. You don’t have to create a new tab to go to another site, but you can more quickly switch between two or more sites without a lot of clicking around or entering URLs. In Microsoft Edge and IE, for example, tabs across the top of the page look like tabs used to divide index cards. Click on a tab to display that page. To close a tab, click the Close Tab (X) button on the right end of the tab. Pressing Ctrl+W closes the current tab. To go to another open tab, simply click anywhere on the tab away from the Close Tab button.